Safety comes first- The New Assessment Program for Southeast Asian Countries (ASEAN NCAP) – which conducts safety tests on cars, has released the crash test reports of the Tata Vista, 2014 Honda City and the Honda Jazz. The crash testing in done taking into account Adult occupant Protection (AOP) and Child Occupant Protection (COP) along with other standard tests. To keep a set standard- the cars were tested with their base variants, which come with driver and passenger air-bags and also separate test on the top-end variants with 6 air-bags. The Tata Vista was the only Indian-made car to undergo the ASEAN NCAP tests, which internationally exports the Vista to Myanmar, Indonesia and Phillipines. The Vista comes with 2 front airbags and it scored 9.24 out of 16 in AOP securing 3 out of 5 stars in AOP and COP, along with an overall compliance rating of 53%. The 2014 Honda City scored 15.8 out of 16 in AOP, securing 4 out of 5 stars in AOP and COP, with a compliance rating of 71%. The top end variant secured full 5 out of 5 stars in AOP and COP with the 6 air-bags being deployed at the time of the crash. The 2014 Honda City broke the Ford Fiesta’s record of 15.78 points tested by ASEAN NCAP and stole the crown of the highest points in the test. The Honda Jazz scored 15.58 points out of 16 in AOP, getting 4 out of 5 stars in AOP and COP. 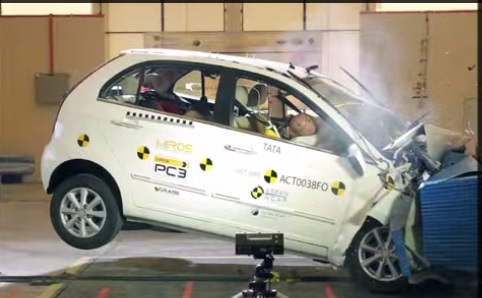 ASEAN NCAP helps to prove how safe a car was at the time of a crash. It also shows that safe cars are not always the most expensive cars, which means also that now-days, each manufacturer is trying to incorporate the highest level of safety in the low variants as well as the top end variants of a particular model. ASEAN NCAP also tested the yet-to-be released Perodua Axia which is to be launched soon for Malasia. The Axia scored 12.91 out of 16 in AOP, securing 4 out of 5 stars in AOP as well as COP. It will be the first and most affordable vehicle to be launched in the market, with the ASEAN NCAP testing result of 4 stars. 2014 Honda City to use 1.5 liter i-DTEC in same state of tune of Amaze?